Architecture is art. Some buildings are just cool to look at. Others are mesmerising and hypnotic, like one compound in East China's Jiangsu province, which has been dubbed by Chinese netizens as the "magical Rubik's compound". Located in the Kunshan district of Suzhou in east China's Jiangsu province, the residential compound on Kong Xiang road has made rounds on the Chinese interwebs due to its unique design. Every apartment building in the complex looks like it's made up of boxes upon boxes upon squiggly lines. The design and colors of the place have Chinese netizens comparing it to a Rubik's cube gone wrong. As of now, it seems the compound is still empty and under construction. 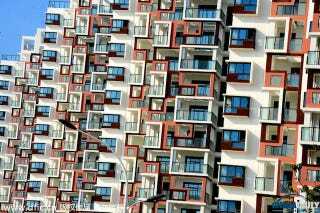 According to Chinese internet portal Sohu.com, the buildings have drawn the attention of the locals. In a video uploaded by a "citizen journalist" in the area, locals can be heard saying that looking at the buildings can be dizzying, but because they live near the complex they've already got used to it. According to an article by Chinese internet giant NetEase, there's a total of twelve "magical" buildings in the complex. NetEase spoke with the complex manager, a Mr. Chen, who says that the apartments have almost all been sold out and that the design for the residential buildings was chosen back in 2010. "In 2010, when the company was going through designs, they decided that they wanted a building that was youthful, energetic, and dynamic," Mr. Chen told NetEase. "From the reactions of the public to the reactions of the buyers, I can say that our objective was complete." Chen stresses that the building's dizzying exterior is just that, the exterior. He says that the interior of the building looks just like any other apartment building, and that the design of the building is also good for conserving energy and absorbing solar energy. Of course, China's no stranger to weird buildings, but judging from the exterior of the building, I think the purpose of these buildings might be more pharmaceutically related.